After nearly twenty years of waiting, stadium lights were used for the first time at DHS on September 7, 2017. The Varsity Girls Field Hockey team enjoyed a victory on that historic evening over Fairfield Warde by the score of 7-0. One week later it was the Varsity Boys Football team who had their first twilight home contest, beating Brien Mcmahon by a score of 48-0. The brand new LED lights are designed to provide maximum field lighting while not disturbing neighbors. The audio system is designed to allow fans to hear game announcements and music while not disturbing neighbors with noise. “It’s really fun, it’s different because it just brings the game to life and it makes the whole environment that much more fun and intense, it’s an entirely different experience,” sophomore field hockey player Molly Hellman said. 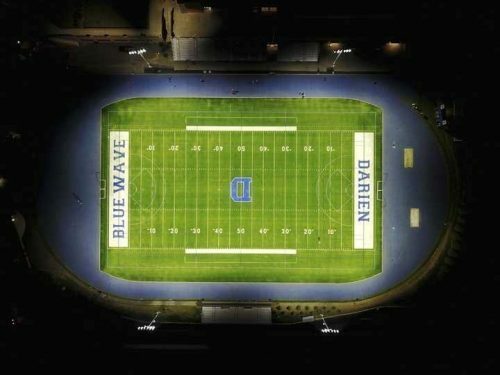 Blue Wave athletes also realize the importance and the support that they get from their fans in games under the lights. “Playing under the lights is unique because everything around you goes black, so everyone is more focused on the game, and everyone is there to support you. Playing under the lights brings the community together because everyone comes out to support our blue wave sports teams and show the players that they care. It is also unique because it helps to get a player more excited for the games. I know on my team that when they turn the lights on for our games, we instantly become 10x more excited and passionate to play field hockey,” said freshman field hockey player Sarah Bogdan. In the spring, sports such as … will utilize the lights, playing night time games. varsity soccer and lacrosse will also have opportunities to have home night games as well. So Wave fans, check the sports schedules and make sure you come out day and night to support the wave!